By Brian Voo in Mobile. Updated on November 12, 2017 . It is as if Christmas came early, as Apple heard the cries of people getting lost with Apple maps, the new and improved Google Maps app is now availabe in the Apple app store for selected countries. 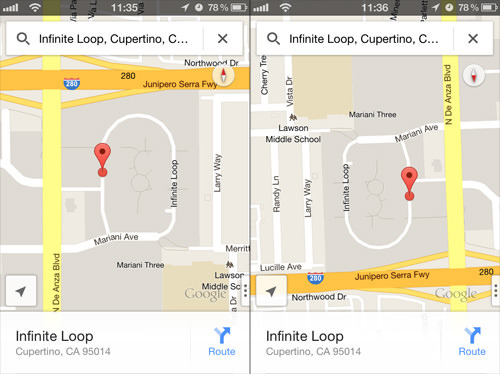 Hands down, any Google Maps alternative is better than Apple Maps, and at first glance, this new Google Maps works even better than the one prior to iOS 6. Although the app has been released in only a few countries, here’s why you should feel impatient towards Google. We found the feature of signing in with your Google account gave the app even more value. The search has been improved to make it feel like you’re searching on a desktop browser with its cleaner user interface that also features gestures. 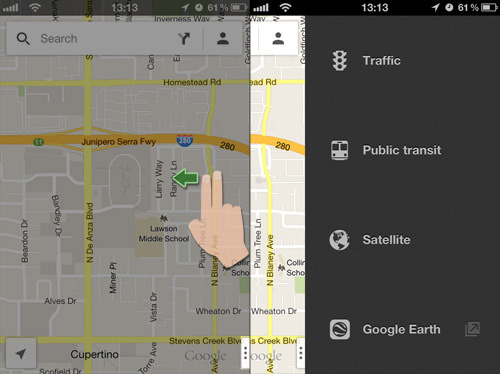 Here’s a few new awesome features we’ve found that makes this Google Maps app so much better. The app now has 3D view similar to modern GPS devices which makes understanding the map easier for some. You can also rotate the map by using 2 fingers in a circular motion for easier navigation which doesn’t restrict you to just the birds eye view. You can also tell which way is north by looking at where the compass is pointing at. 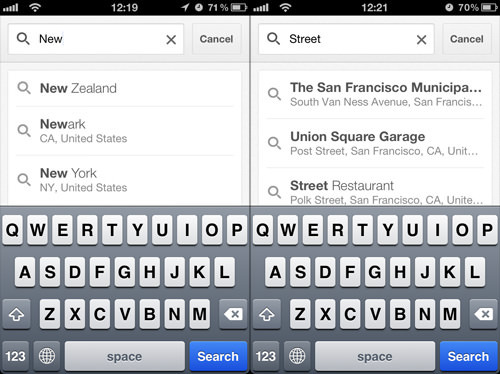 The search function has also been improved as you can see multiple location results while you’re typing. 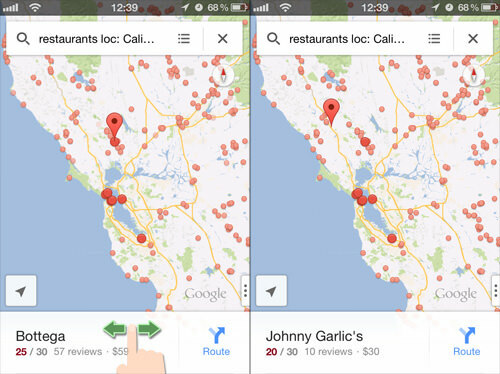 You can also search for point of interest (POI); "Restaurants in California" will bring up many restaurant locations represented by the red dots on the map. 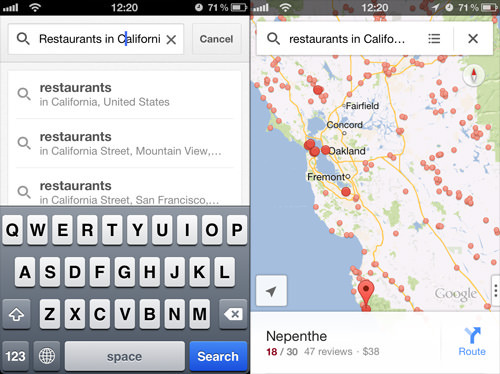 You can then tap on the restaurant you want to find out more info about it. You can call the restaurant, save it into your bookmark list, share the URL by copying it to your clipboard, or via email or SMS, see pictures, view their website and menu, or book a table (depending if they support these feature). At the moment, there are a few gestures you can use within the app. You can swipe in from the right with 2 fingers to show the more options menu. Alternatively, you can press the more options button at the bottom to the right side which we find works better. 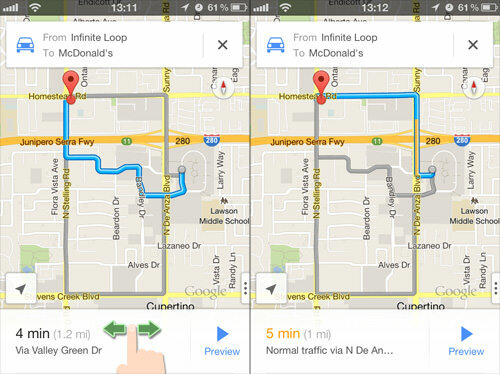 You can also swipe from left and right to change the navigation route between you and your destination. 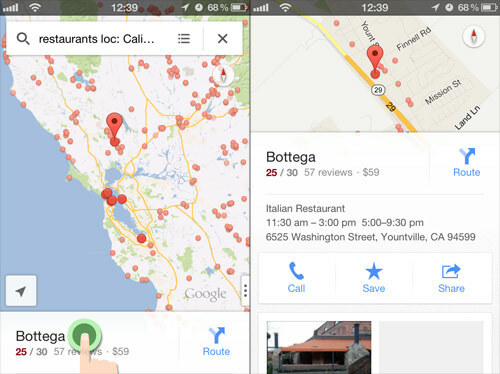 In the same manner, you can browse through restaurants or other suggested locations as well by swiping left and right. Without a doubt, in order to navigate to a place you’re not sure about, you’ll use Google Maps on your desktop browser to look for directions before embarking on your journey. When you’re signed in to a Google account and use Maps on a desktop browser, your desktop search history will be synced into this app as well provided you signed in with the same account. 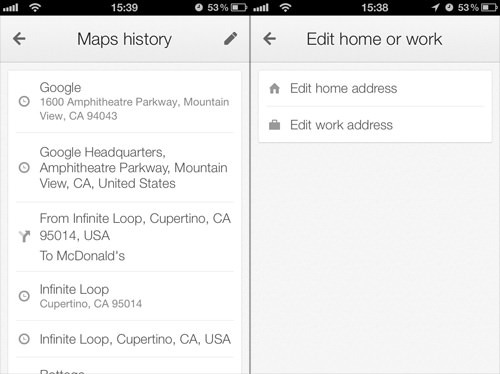 You can also add your home and office address to quickly navigate back from wherever you are. 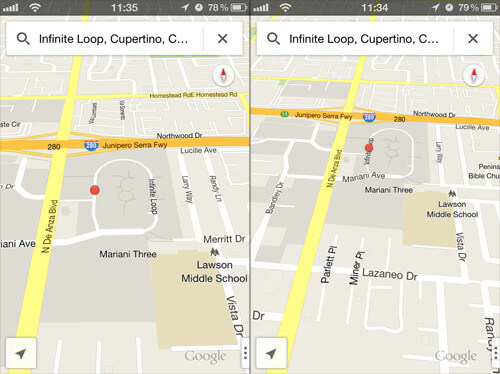 In conclusion, we think that this new version of Google Maps is superior to the previous version with better features.